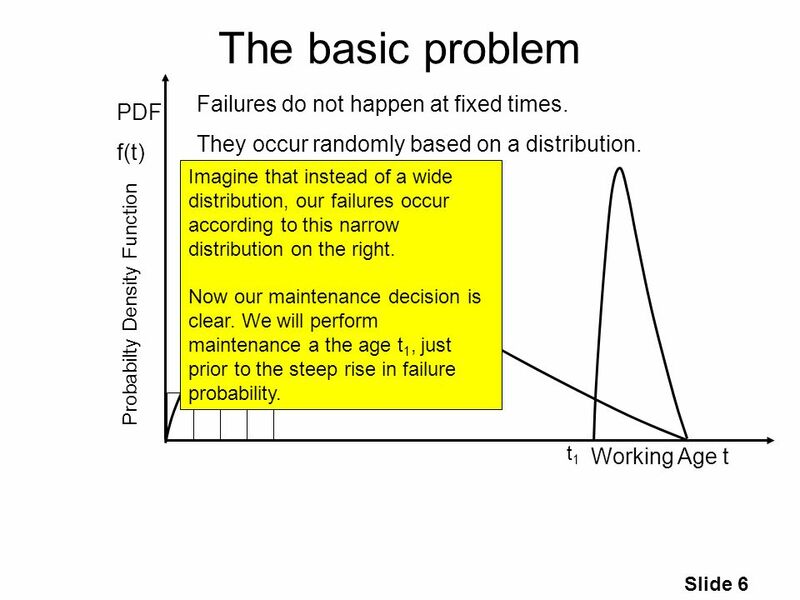 Slide 1 The basic problem Working Age t PDF f(t) Failures do not happen at fixed times. They occur randomly based on a distribution. Probabilty Density. 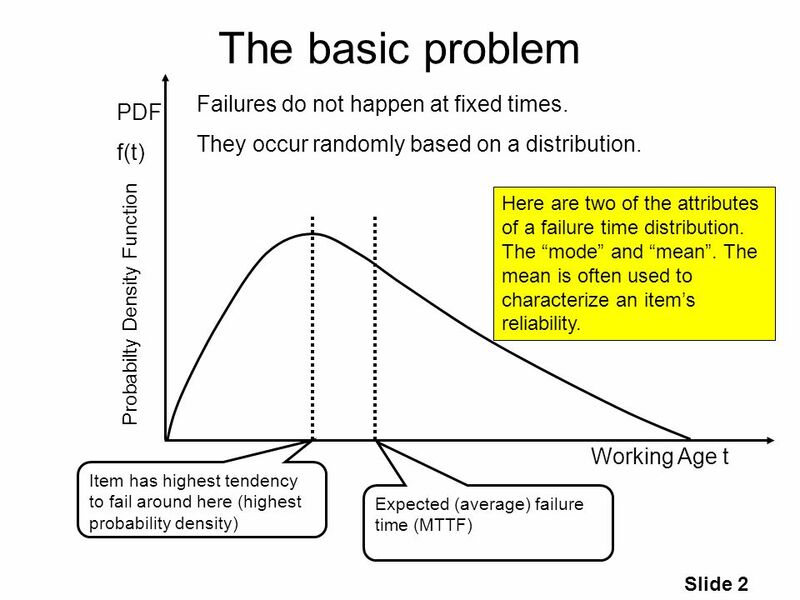 2 Slide 2 The basic problem Working Age t Item has highest tendency to fail around here (highest probability density) Expected (average) failure time (MTTF) PDF f(t) Failures do not happen at fixed times. They occur randomly based on a distribution. Probabilty Density Function Here are two of the attributes of a failure time distribution. The mode and mean. The mean is often used to characterize an items reliability. 3 Slide 3 The basic problem Working Age t PDF f(t) Failures do not happen at fixed times. They occur randomly based on a distribution. 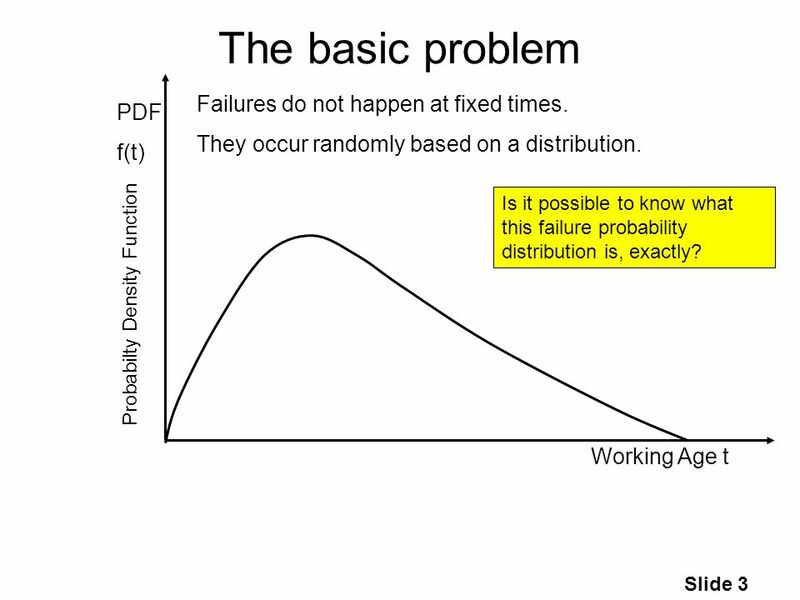 Probabilty Density Function Is it possible to know what this failure probability distribution is, exactly? 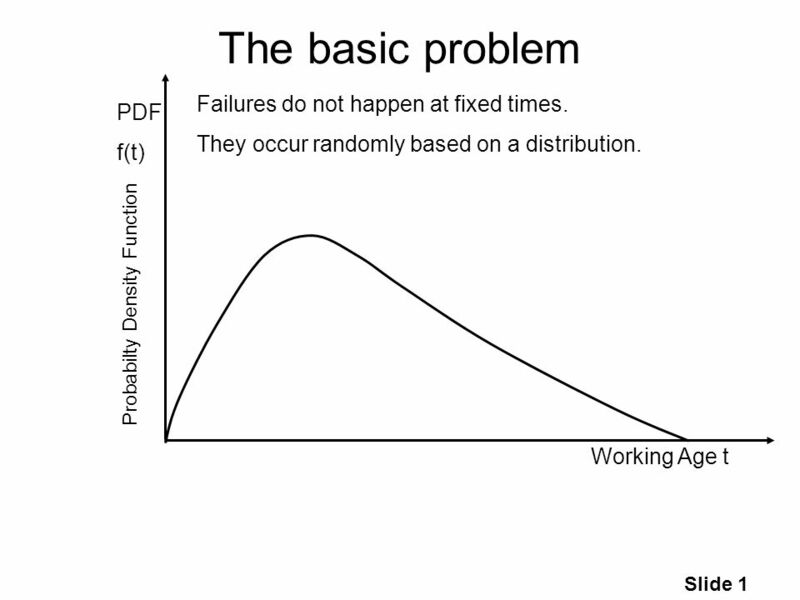 4 Slide 4 The basic problem Working Age t PDF f(t) Failures do not happen at fixed times. They occur randomly based on a distribution. Probabilty Density Function Yes, if we have a sample of an items (or fleet of items) past life cycles. Draw rectangles, as shown, such that their width is a convenient age interval, say a month. And their height is the percentage of the units that failed in that age interval. 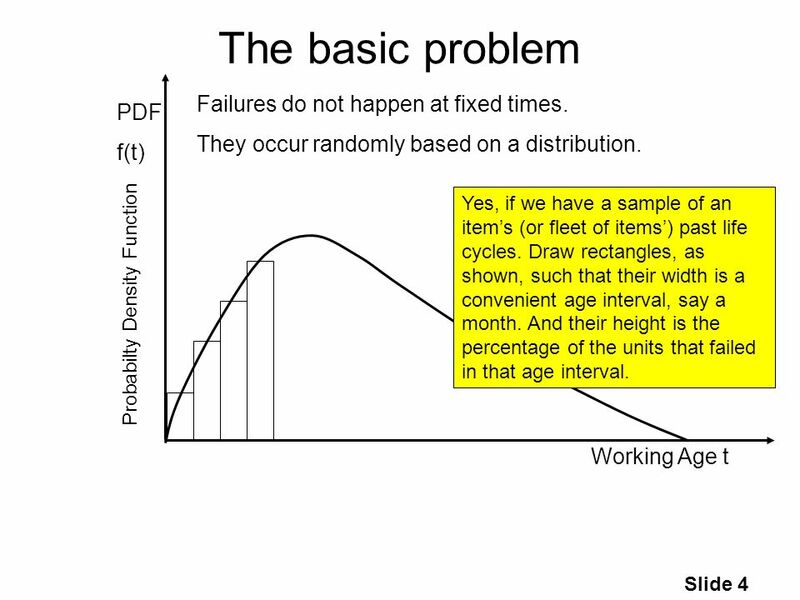 5 Slide 5 The basic problem Working Age t PDF f(t) Failures do not happen at fixed times. They occur randomly based on a distribution. Probabilty Density Function But how does knowing the shape of the distribution help us make a decision on when to do maintenance? 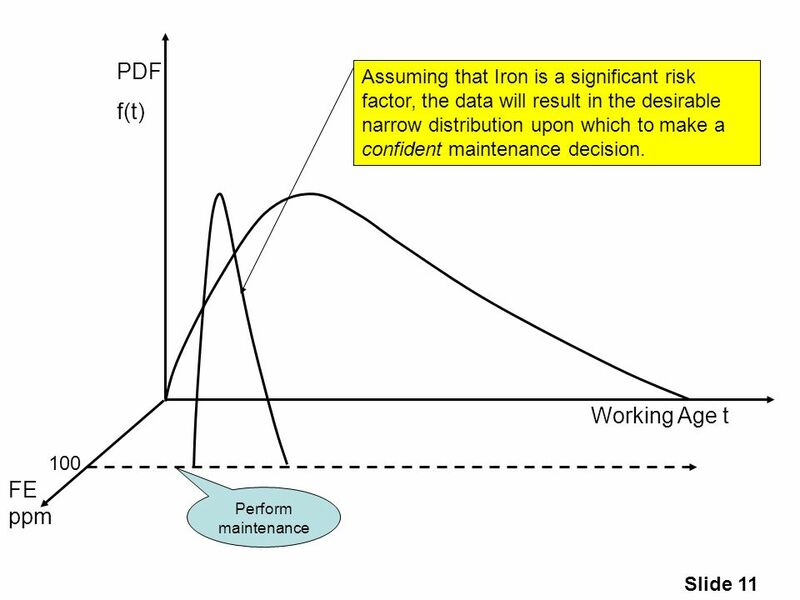 If we perform maintenance at any age t, we will incur failures represented by the area under the curve between 0 and t. So how can we make the right maintenance decision? 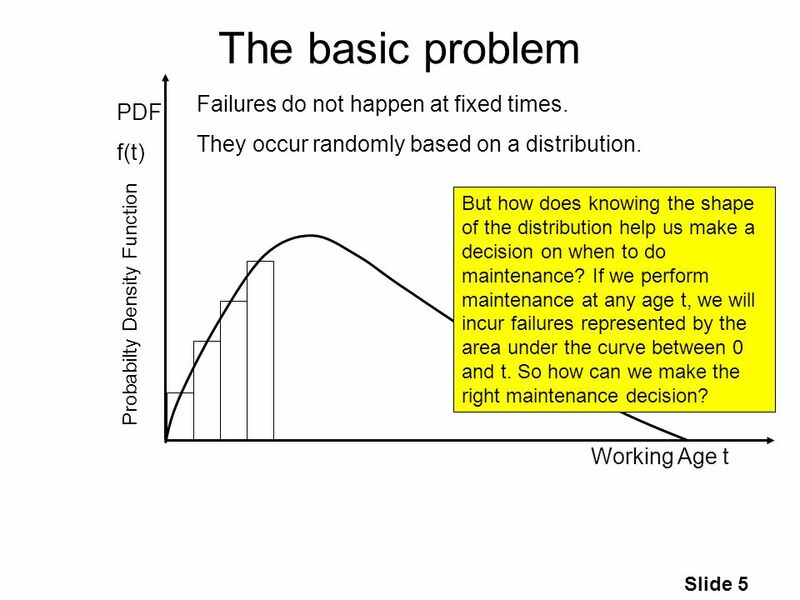 7 Slide 7 Working Age t PDF f(t) Unfortunately, however, in maintenance most failure distributions are of the wide, spread-out variety. 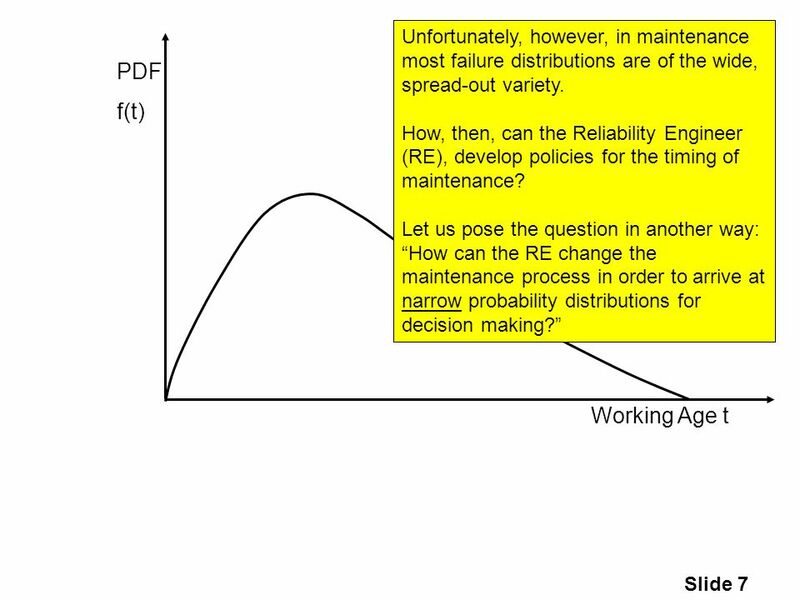 How, then, can the Reliability Engineer (RE), develop policies for the timing of maintenance? Let us pose the question in another way: How can the RE change the maintenance process in order to arrive at narrow probability distributions for decision making? 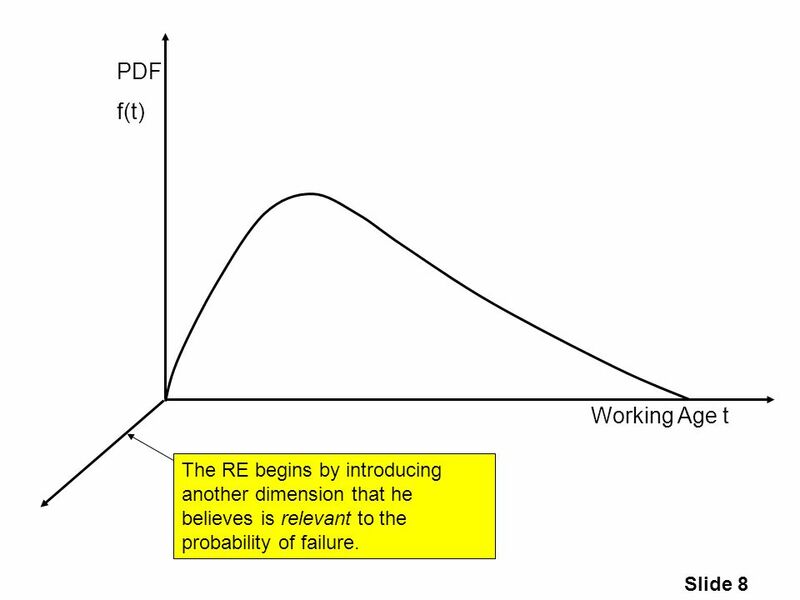 8 Slide 8 Working Age t PDF f(t) The RE begins by introducing another dimension that he believes is relevant to the probability of failure. 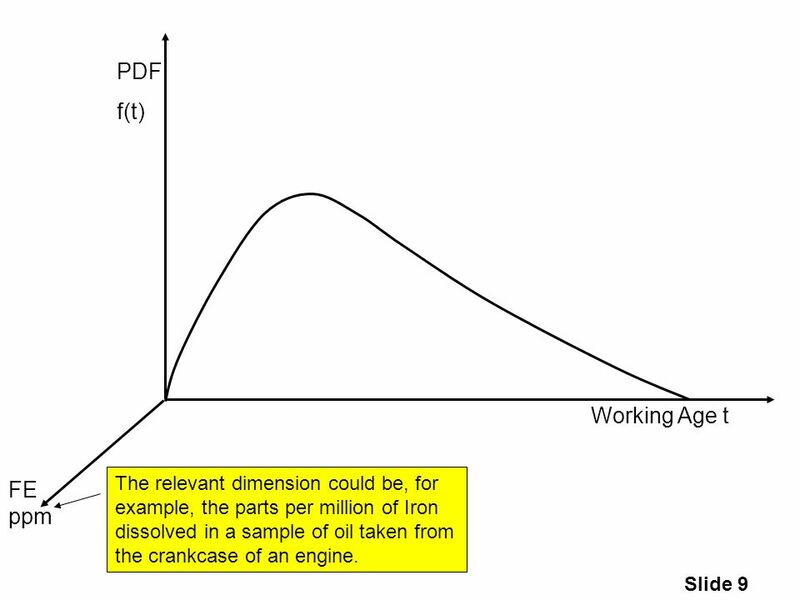 9 Slide 9 Working Age t PDF f(t) FE ppm The relevant dimension could be, for example, the parts per million of Iron dissolved in a sample of oil taken from the crankcase of an engine. 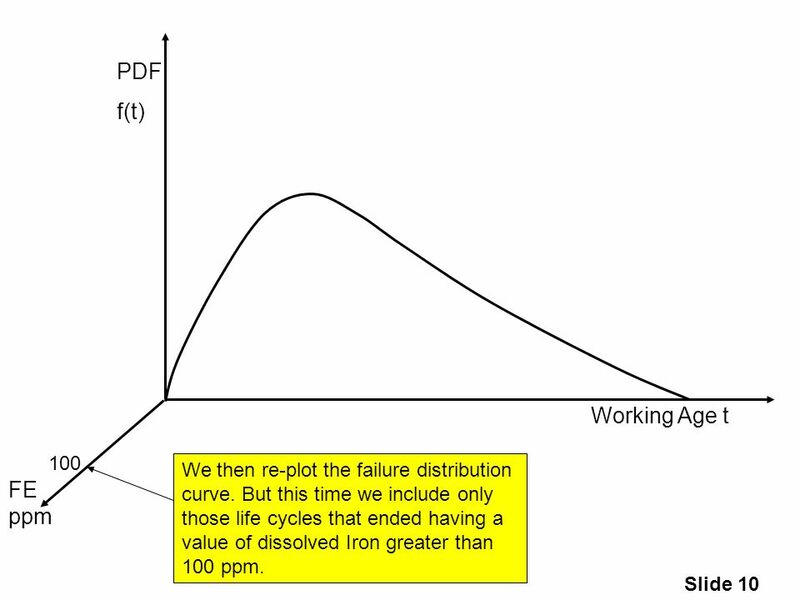 10 Slide 10 Working Age t PDF f(t) FE ppm 100 We then re-plot the failure distribution curve. But this time we include only those life cycles that ended having a value of dissolved Iron greater than 100 ppm. 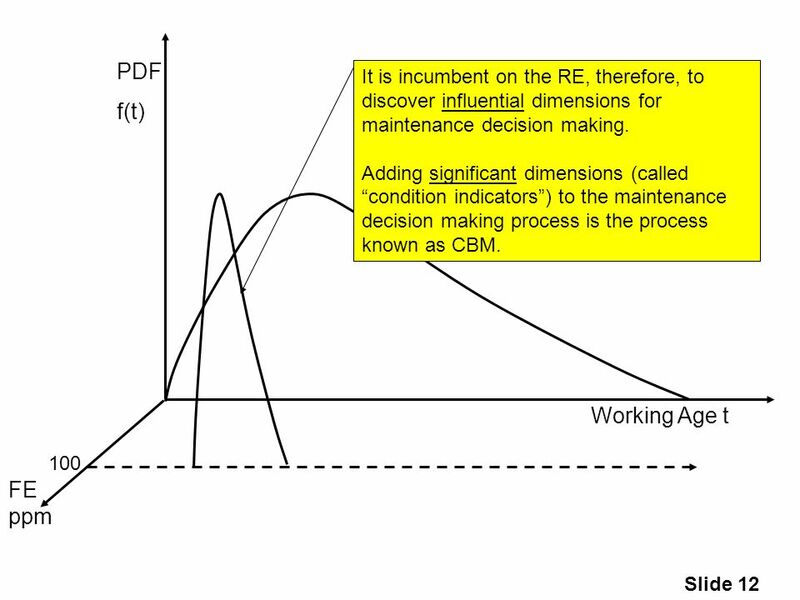 12 Slide 12 Working Age t PDF f(t) FE ppm 100 It is incumbent on the RE, therefore, to discover influential dimensions for maintenance decision making. 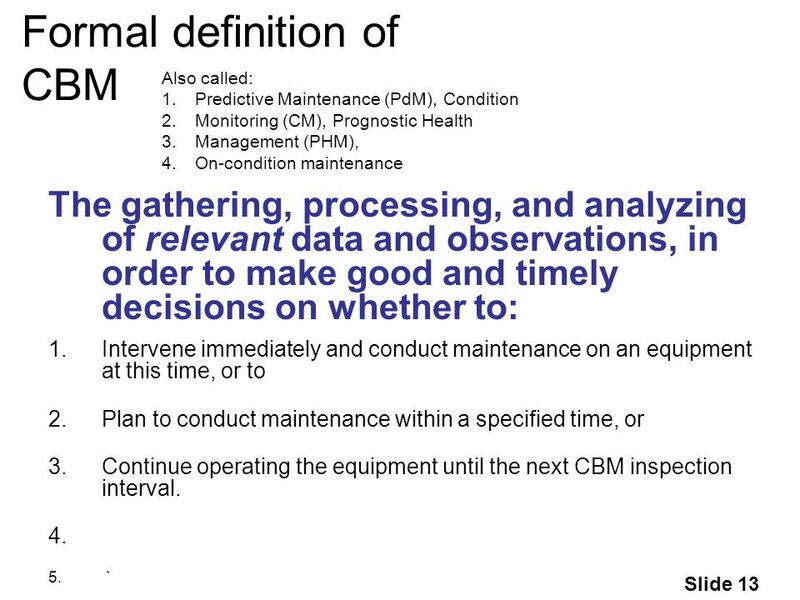 Adding significant dimensions (called condition indicators) to the maintenance decision making process is the process known as CBM. 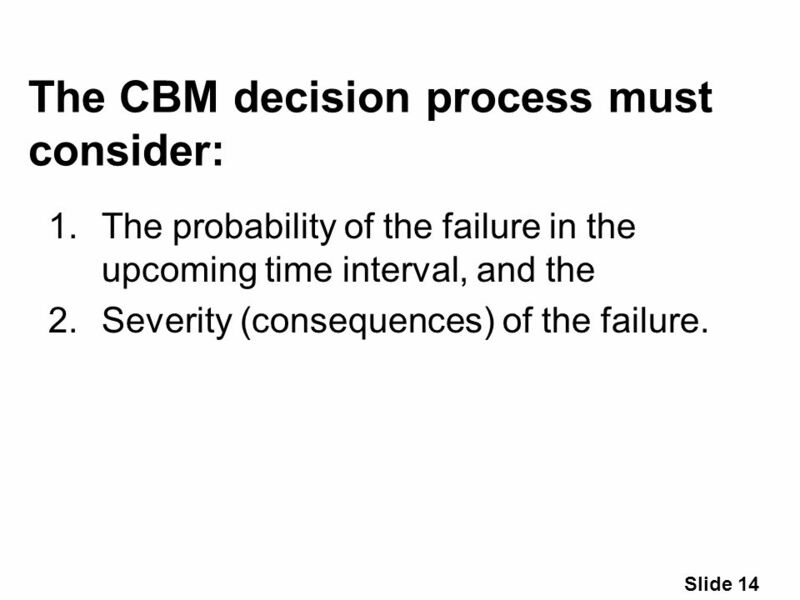 14 Slide 14 The CBM decision process must consider: 1.The probability of the failure in the upcoming time interval, and the 2.Severity (consequences) of the failure. Download ppt "Slide 1 The basic problem Working Age t PDF f(t) Failures do not happen at fixed times. They occur randomly based on a distribution. Probabilty Density." Time to failure Probability, Survival, the Hazard rate, and the Conditional Failure Probability. STLE 2012 CBM and Reliability Engineering Conference Achieving Reliability from Data at Cerrejón A Living Reliability Centered Maintenance (LRCM) project. R_SimuSTAT_2 Prof. Ke-Sheng Cheng Dept. of Bioenvironmental Systems Eng. National Taiwan University. Evaluating Provider Reliability in Risk-aware Grid Brokering Iain Gourlay. Are our results reliable enough to support a conclusion? Statistics: Purpose, Approach, Method. The Basic Approach The basic principle behind the use of statistical tests of significance can be stated as: Compare. Module 3 UNIT I " Copyright 2002, Information Spectrum, Inc. All Rights Reserved." INTRODUCTION TO RCM RCM TERMINOLOGY AND CONCEPTS. Continuous Random Variables. L. Wang, Department of Statistics University of South Carolina; Slide 2 Continuous Random Variable A continuous random variable. EPIDEMIOLOGY AND BIOSTATISTICS DEPT Esimating Population Value with Hypothesis Testing. FURTHER APPLICATIONS OF INTEGRATION Probability In this section, we will learn about: The application of calculus to probability. Failure Patterns Many failure-causing mechanisms give rise to measured distributions of times-to-failure which approximate quite closely to probability. Intro to Statistics ST-L1 Objectives: To review measures of central tendency and dispersion. Learning Outcome B-4.